Growing your own food is not easy. Raising your own food is not easy. Many people think they can just put some seeds in the ground and they will have food. Many more people are easily intimidated by raising animals for meat. However, they think they could do it if they had to when an SHTF happens. The fact is that the truth is very, very different. I have been gardening for many years. For a lot of those years, I was a lazy gardener. I didn't want to do the work of improving my soil, providing critter control, or even weed the garden. My garden couldn't have sustained us for more than a few meals, much less preserve any of it. It wasn't until I got into a preparedness, self-reliant state of mind that I started to take gardening more seriously. I started weeding it more religiously. I planted perennials that would provide food year after year. I started raising layer hens and put their used bedding and fertilizer on my garden. Talk about a huge improvement to my soil! When we had critters eating my plants, we put up a fence. We moved plants around for a better layout in the garden. We learned about companion planting. Gardening was a lot more work than I planned on it being, but I enjoyed the fruits of our labor. Some things I was scared to try ended up working for the garden. My garden started growing like crazy! Now I can eat, preserve what we don't eat, and still have enough to give away to friends and family. Do we still know everything about gardening? Oh no. Every year I learn something new. Some plants fail. Seeds don't come up (zucchini last year). Mistakes are made. Surprises happen. I didn't pick broccoli at the right time last year and it bolted (and tasted awful!). We thought a plant that had come up was a summer squash, but it ended up being a weird pumpkin hybrid dropped by birds. That same plant took over my garden just like the pumpkins did the year before. My peas did not fill out the pods very well. The fall planting of the peas did not go well either - they were bitter tasting. I had my first decent crop of bell peppers last year after trying for years to get more than two peppers from six plants! Gardening and raising livestock are skills. You need to learn how to do these things in order to learn these skills. Like learning any other skill, there is always a learning curve. You will think you know it all, but find out you have a lot more to learn. You can't expect to read all about gardening and raising livestock and be able to do it when you are desperate for food. You have to learn to deal with loss. The very first batch of chicks I had, I lost nine chicks in the first three days because they needed a heat lamp. Since I had them inside the house, I thought I had the room warm enough. That wasn't good enough. After I replaced them, I kept a heat lamp on them for five weeks. We had fifteen laying hens and lost them all to a mink getting in the chicken coop. In a different time, we would have been devastated to lose a vital protein source. We were sad to lose good eggs and the small income from selling them. We were devastated to lose chickens to a senseless killing because minks like to kill for the fun of it. We had lost a couple of hens to hawks before, but nothing like this. Did we learn something new? Yes, we did. While I knew minks existed, I had no idea the damage they could cause. I didn't know what they looked like or how small they were. We are now changing the fencing in the outdoor area of the coop to prevent this from happening again. We are now waiting for fifteen chicks to grow up and start laying. Since this is a new breed of laying hens for us, we are learning about them. 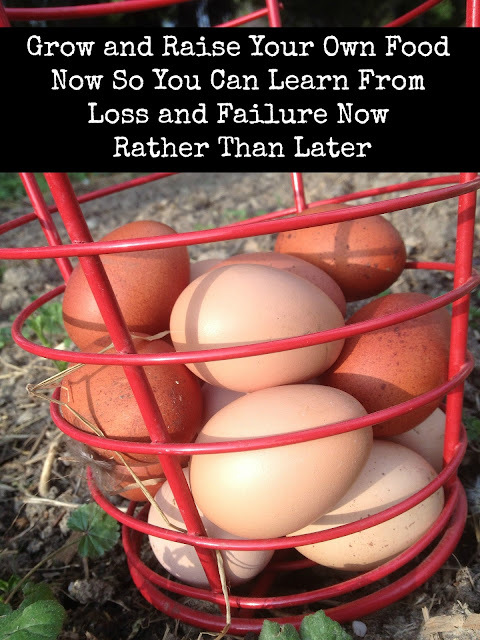 So gardening and raising chickens (and other livestock) is not as easy as it sounds. If this is part of your plan for preparedness, you need to practice these skills now. I have been practicing these skills for years and am still learning new things. Most gardeners will tell you that their gardens are not the same from year to year. Chickens are susceptible to predators and human mistakes. One year is not the same as another. Every batch of chicks I get is different from the last one. I am always learning something new. If you are planning for your garden to provide all your food needs, you need to be gardening now and making that garden big enough to provide for all your food needs. You will learn by trial and error how much you need to plant, how big your garden needs to be, and what you need to plant for this garden to provide your food for a year or longer. Most people do not have enough area to plant this much so you also need to learn how to garden using trellises and poles. Again, this is something that should not be learned when you are in an emergency situation. It needs to be learned now. If you are planning on raising chickens, ducks, pigs, goats, and more, you need to learn now. Raising livestock is never easy. You have to deal with loss and injuries. You have to deal with butchering your own livestock. You have to learn how to raise animals from babies to adults. If this is part of your prepping plans, you need to be working on this now. If you live in town, see if you can have these animals in town. Otherwise, befriend a local farmer and ask if you can have some livestock at their place. If you live on an acreage, get started! These are skills to be learned now, not later. As with any other skill, the time to learn them is now, not when a crisis hits. With gardening and raising livestock, you could be facing starvation before you have any food if you didn't know how to raise it before. Having a stockpile of seeds is great, but learn how to grow those seeds now, not later. Learn how to raise your own food now, not later. As crazy as it seems, some people make prepping harder than it has to be. Learning skills can be hard, but the end rewards are so worth it. The work can be hard, but the pay off is that jobs get done and you have accomplished something for the future. However...preppers still need stuff. We can produce a lot of our own things and survive just fine. We still need the items that will make survival easier now and, heaven forbid, if anything bad happens. We need things to keep our lifestyle simpler and easier if something happens. Over the eight years or so that I have been prepping, I have some things that I buy almost every month. Some months when the budget is tight, I might not purchase any of these. Then I appreciate having these things on hand! This post is a part of the 30 Days of Preparedness Round Robin with Prepared Bloggers! Thank you for visiting! I love prepping lists! I have so many printed out and filed in a binder so I can look at them. I get motivated from them and finds all sorts of ideas to get things done! I am offering you today a list of 10 totally free prepping things to do. Some of the things will take only a few minutes to do, some will take a few hours, and some might take more time than that. You can do these things with your family or invite your friends over to do these things. The only thing that might not make this totally free is canning jars. However, I am assuming most of you have jars on hand! New preppers wonder what they should be buying for their preps every month. More experienced preppers wonder what holes they should be plugging in their food storage to be better prepared. We all know we should be constantly adding and rotating our food storage every month in order to have a good supply. Since I have written the 10 Preparedness Items You Should Be Buying Every Month and Top Ten Items You Need For Your Food Storage, I have found my preparedness mindset changing a little bit. I think they are things you should be buying every month that are perishable items and non-perishable items. This list will concentrate on the non-perishable items because those are the ones most important to your food storage. Sign up for newsletters, new post updates, and special offers!